Very few places inspire the whole world for its sheer scale, vibrant pace, elegant surroundings, and impressive architecture as New York City. Every time one sets foot in New York, one realises that this is the city that has it all: the most beautiful urban park in the world, fantastic art galleries and museums, excellent restaurants and a fascinating mix of nationalities and languages. However, what makes you love New York more and more every time you visit is the inimitable, audacious architecture. New York has always been a paradise for architects and interior designers. This promised city has offered the possibility to grow and excel in its creative heights for generations. If real estate moguls profit from property prices, it is the communities of residents and visitors of this fortunate city that benefit from being able to inhabit and experience such outstanding architecture. New York stands out not only because of its well-designed office buildings and museums, but also in its landscaped parks and secluded corners of Manhattan and outer boroughs, carefully respected and promoted by the city’s residents for many years. 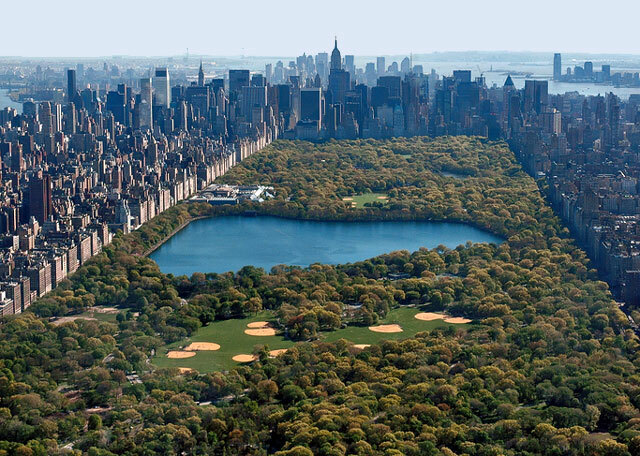 Central Park, one of the best examples of landscaped architecture in the world, opened in 1859 and rightly became a National Historic Landmark in 1963. The designs by Frederick Law Olmsted (landscape architect) and Calvert Vaux (architect) allowed for hundreds of acres to become an oasis of green socialising space for decades, and currently attracts over 25 million annual visitors. 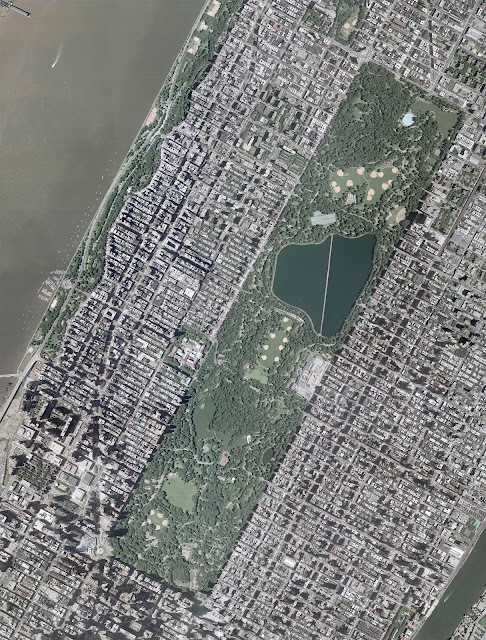 With its lakes and fountains, and innumerable depictions in films and TV series, Central Park has become a dear and familiar space throughout the world, framed by blocks of apartments and offices that surround it. 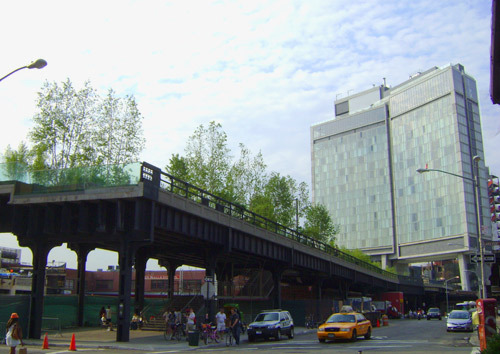 More recently, the High Line redevelopment has attracted numerous visitors who enjoy the experience of the city it allows, as well as great views of the Hudson River and New Jersey. 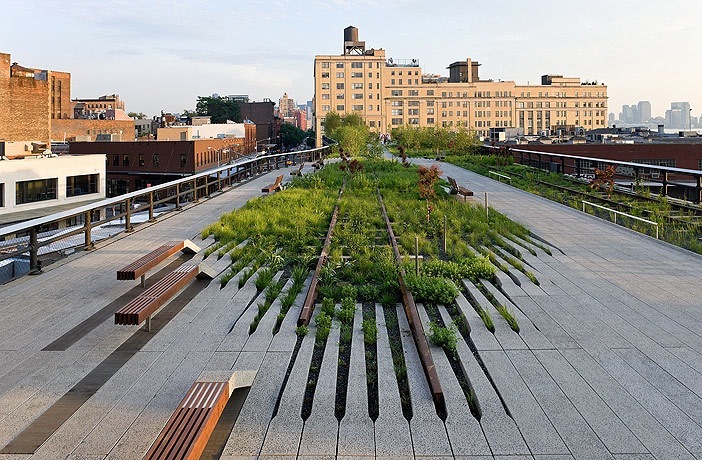 Built on a section of the former elevated freight railroad of the West Side Line along the lower west side of Manhattan, this green space has drawn more attention to one of the most charming parts of New York. The joint work of James Corner Field Operations (landscape architects), Diller Scofidio + Renfro (architects), Piet Oudolf (planting design), and Buro Happold (engineering design), the High Line has quickly garnered a warm place in the hearts and minds of New Yorkers and tourists. Its creative designs over an elevated structure stand for a modern reinterpretation of the mythical hanging gardens, landscaped structures to appropriate and enjoy nature in man-made settings. These green spaces in a city renowned for its high rise developments serve as a way to remind inhabitants and visitors to look both down from the soil and up to the top floors of skyscrapers reaching for the clouds. 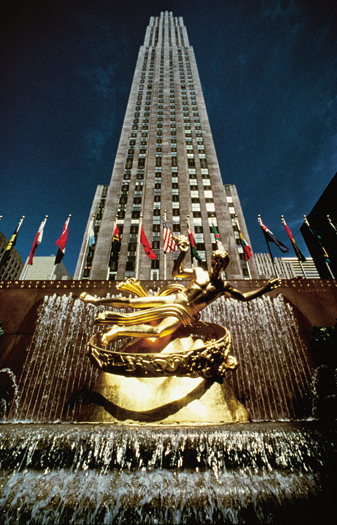 The Rockefeller Center, designed in the 1930s by architect Raymond Hood and others, typifies this ambition to embrace space both horizontally and vertically. The Center is a complex of 19 commercial buildings covering 22 acres between 48th and 51st streets, and it has also been declared a National Historic Landmark in 1987. This Art Deco wandering maze of offices, shops, entertainment areas, and public transport links is still listed as one of the largest private building project ever undertaken in modern times. A few blocks south stands the elegant Chrysler Building, designed by William Van Alen, and also a magnificent example of Art Deco. Its top floors covered in ribbed stainless-steel cladding represent Van Alen’s own ambition to reach for the stars by depicting a radiating sunburst pattern with triangular vaulted windows. The silvery metal used on these top floors decorated with flying eagles allow for the building to stand out in midtown New York, as a beacon of hopeful design. More recently, the angular elegance of the Bank of America tower at One Bryant Park, by Cook + Fox Architects, became another example of New York’s intention to promote architecture as the embodiment of creative hope. Renowned for its environmentally friendly design features, One Bryant Park typifies a new architecture of stylish design pushing forward the notion of the office building as box. Its twisted angles allow for the building (currently the second tallest in the city) to become different as one walks towards it, particularly in its reflection of light and shade. 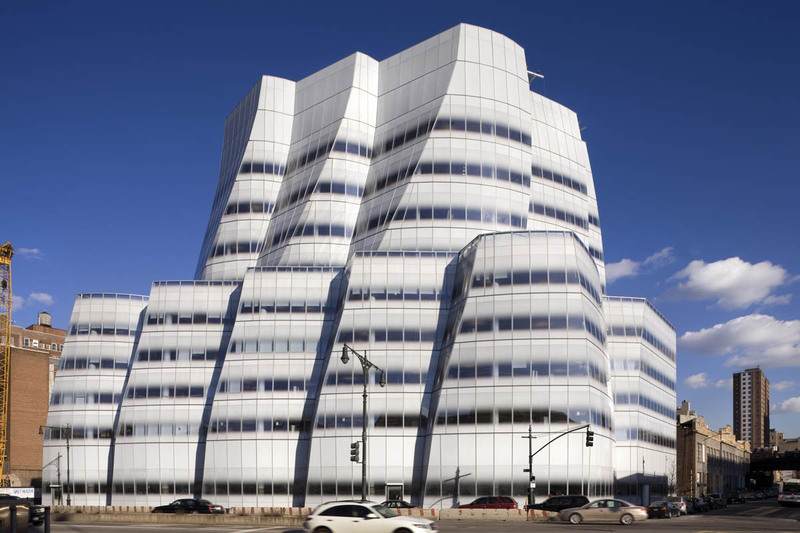 Downtown, in Chelsea, the 2007 building designed by Frank Gehry to house IAC Corporation dazzles and grows on one’s perception of it. On a first view, the shocking white and grey tones stand out in the area and are accentuated by a seemingly irregularity of its jutting structures. 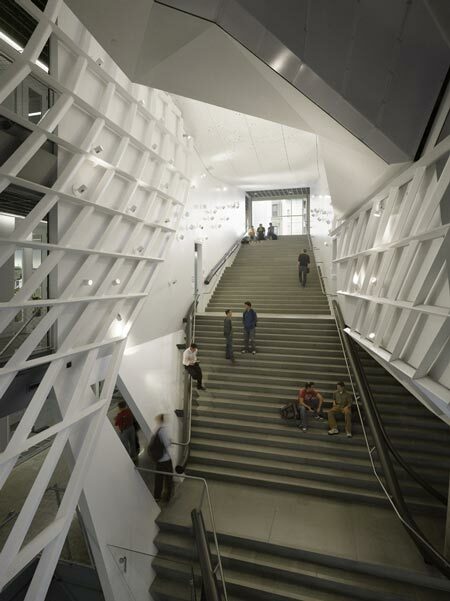 However, the more one looks and the more one stands close by to see how the light of day diffuses the awareness of space, the angularity of the building becomes extremely dynamic. As the building stands facing the Hudson river on 11th Avenue with 18th Street, it acquires an almost naval dimension, with its 10-storey towers becoming sails ready to take the space outwards. The interiors reflect this with office and meeting spaces allowing the possibility of facing the river. New York City also dazzles with buildings designed to host art collections and exhibitions that have pushed forward architectural design over the twentieth century. 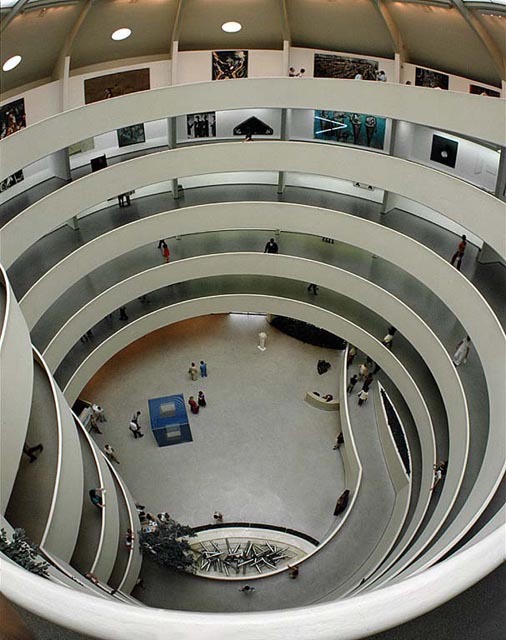 An example is the Guggenheim Museum, which opened in October 1959 to a storm of criticism. 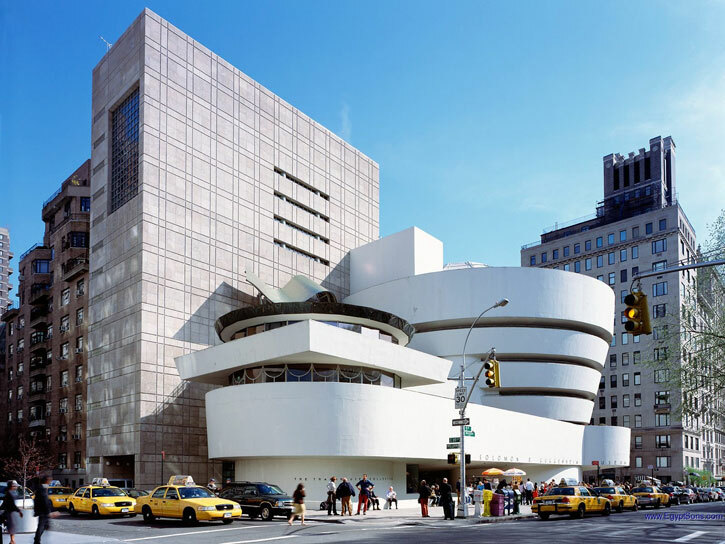 Frank Lloyd Wright’s designs deserved the dubious pejorative comments that they were obfuscating the art collection and attracting visitors to the building for the architecture alone and not for the art on display. However, visitors soon realised that it was precisely the ingenious internal spiral construction of the building that allowed the relationship between art and human gaze to become more intimate. In a way, the opening of the Guggenheim half a century ago marked more than a bold step in architecture; it was also the birth of a post-modern, contemporary, and democratic appropriation of art by the individual. A few years later, and a few blocks north, Bauhaus architect Marcel Breuer saw his designs for the Whitney Museum of American Art come to fruition. In 1966, and after decades of moving, the impressive collection of the Whitney family was housed in this stunning building. 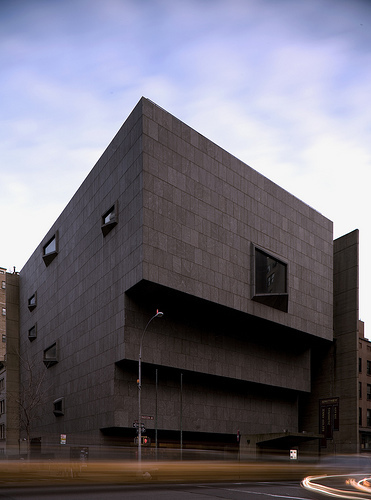 With its cantilevered spaces jutting onto Madison Avenue and its small windows, the museum resembles a medieval fortress that protects its inner cultural treasures. This image is only strengthened when watching visitors to the cafe and shop on the basement level from a moat-like ground floor area that connects the city to the building via a bridge. In more recent years, Yoshio Taniguchi’s complete redevelopment of the Museum of Modern Art only confirmed its collection as occupying the top ranks of artistic curatorial quality. 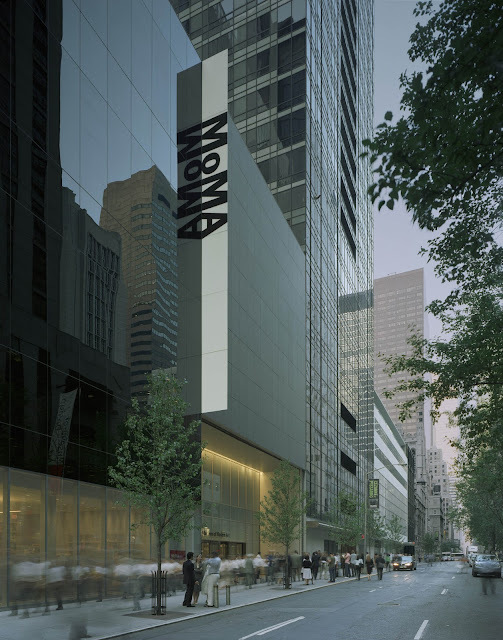 Anyone who visits MoMA for a few hours cannot leave the building and its collection behind without feeling inebriated by the scale of the building and the intelligent layout of the rooms and access areas. Downtown, in the Bowery, SANAA architects have recently offered the quirky and graceful New Museum, the building that made this brilliant architectural practice win the coveted Pritzker Price in 2010. 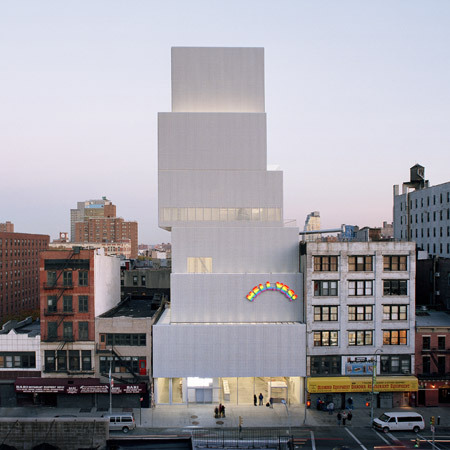 With its reflective cladding and alternating boxes, the New Museum literally shines on the Bowery. Its bright interiors and the top floor Sky room, with its South-facing balcony, stand out in an otherwise downtrodden (yet fashionable) part of Manhattan, housing an impressive international and eclectic collection. 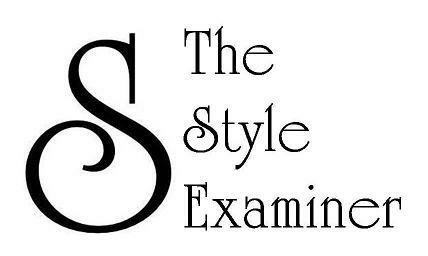 But it’s New York’s latest major addition to the education scene that seduces the most. 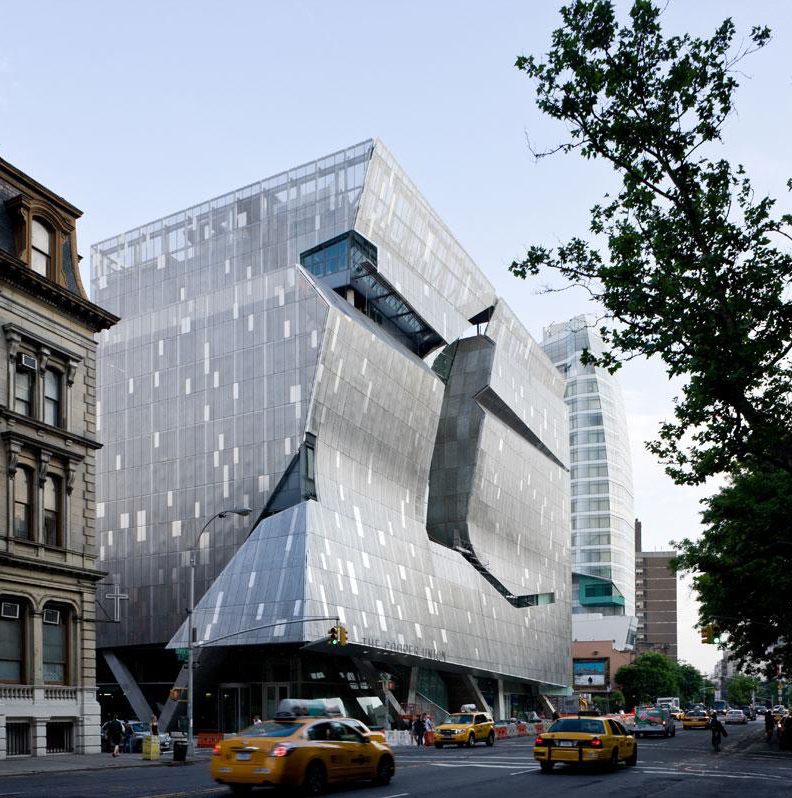 Morphosis’s Cooper Union building, designed to house its new academic building, reinterprets the architectural landscape of New York while questioning the assumption of space, lines, and overall design. By literally cutting into the facade of the building, almost in a curious reinterpretation of the city’s grid-like street layout, architect Thom Maine’s clever design pushes form and space usage forward like very few buildings. Its irregular internal staircases and external cladding are extremely seductive in the way they break traditional notions of architecture and space, yet keeping a very green agenda for the building. With its wink to the history of architecture and the more recent post-modern definition of space, the building stands for the playful elegant definition of what New York in itself is: an audacious cradle of creative hope for generations of architects and those of us who appreciate the urban space that surrounds us. coool, knew about 1/2 of these, some of the buildings make me feel uneasy just staring at them, the stacked boxes one! for instance and the IAC building's windows seem smudged! in the picture and I wondered if it would be that way in person. Hard on my eyes. My favourite - hard to choose one, but the Guggenheim on central park - the circular building In a park with square, rectangular buildings all around it and its white interior, exterior are amazing! I wonder how hard it was to get permission to get it built was?